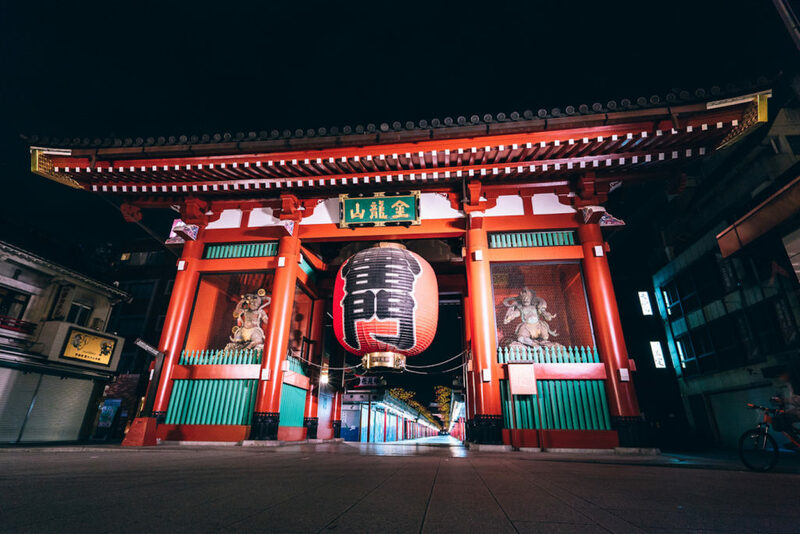 It’s hard to describe the landscape of Tokyo without falling into the trap of cliches about how the city’s futuristic architecture juxtaposes its historical landmarks, or the excitement of uncovering the hole-in-the-wall ramen joints tucked down laneways. Still, when you boil it down, these elements are exactly what makes the city so beautiful to look at. But for a fresh perspective on the capital, exploring the city at night is an expansive way to look beyond the obvious. In the neon-lit shadows, bustling tourist attractions become eerie echo chambers, the glittering skyscrapers look like ripples on moonlit water, and locals share midnight secrets. So, whether you’re wanting to snap gleaming streetscapes from above or get down and dirty with basement bar owners, here’s our pick of where and how to experience some of the best night views in Tokyo. 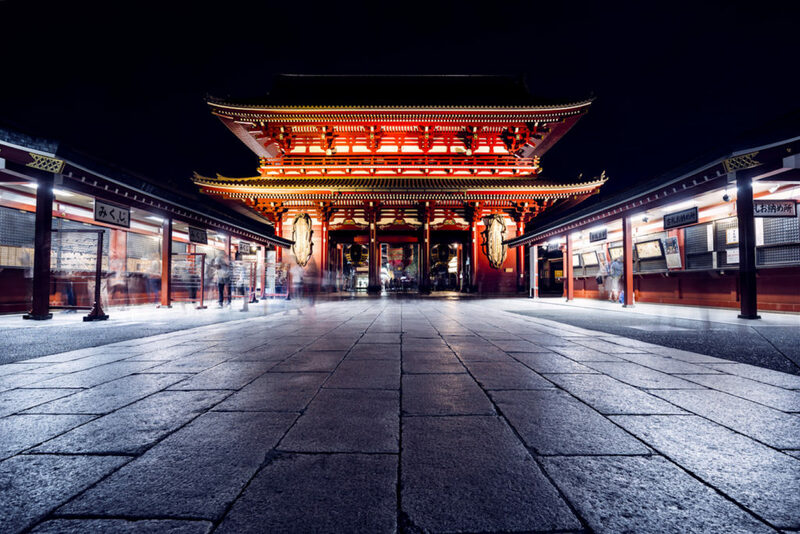 Tokyo’s oldest temple, Sensoji, is one of the city’s most famous tourist locations — and also one of its most crowded. 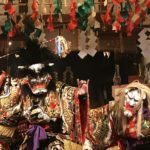 Around 30 million tourists visit the Asakusa landmark each year, and given the influx of tourists in recent years, that statistic is surely set to grow. During the day it can be a little difficult to really soak up the ambiance of this richly historic site when you’re ducking under selfie sticks and weaving through slow crawling packs of tour groups. However, if you visit Sensoji at night it’s a strikingly different experience. If you make it as the sun is setting, you can get there in time to visit the shops on Nakamise-dori just before they shut. As the last lot of visitors trickle out it’s the best time to browse, but do be careful not to overstay your welcome and leave before the stores actually pull down the roller doors! Once the stores close, head on over to the temple. Tall light towers that illuminate Sensoji, Kaminarimon (Thunder Gate) and the nearby five-storied pagoda maximize the luminosity of the temple’s already vibrant color. It’s the closest you’ll get to having the whole place to yourself. It’s quiet, peaceful and the best atmosphere in which to appreciate this Japanese architectural icon. The main trouble with climbing Tokyo Tower or Tokyo Skytree in order to see the city is that you can’t actually admire these landmarks themselves. Both of these structures are iconic figures of Tokyo’s landscape, so the perfect city photo shot would be a little amiss without them in it. It’s like taking a photo of Paris without the Eiffel Tower. 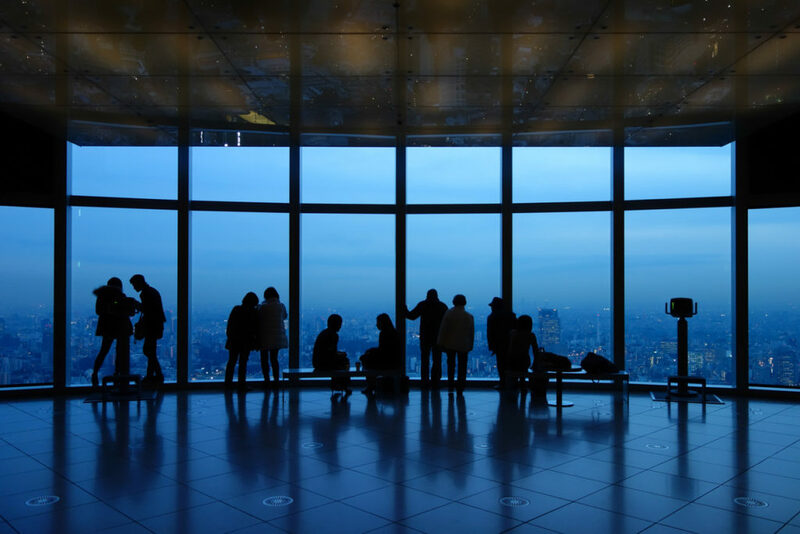 With floor to ceiling windows offering incredible panoramic views from Skytree to Mt Fuji, the Mori Observation Deck in The Roppongi Hills’ Mori Tower is your answer to this city view dilemma. Go up a little higher and you can also access Tokyo City View Sky Deck, an open-air 360-degree observation platform for an entirely obstacle free city view. Being completely unobstructed, the Sky Deck arguably offers one of the best views of any city ever. Standing there with the city unravelling all around, you’ll feel like a rich magnate just dropped off by your helicopter on top of the city you own. 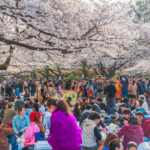 Daily 10 a.m. - 11 p.m., Fridays and Saturdays open until 1 a.m.
Not one for the faint of heart, a helicopter tour over Tokyo is an unparalleled, and very action movie-style way to admire the full, overwhelming scope of what the city has to offer. If you’ve done the observation deck, then it’s time to level up. 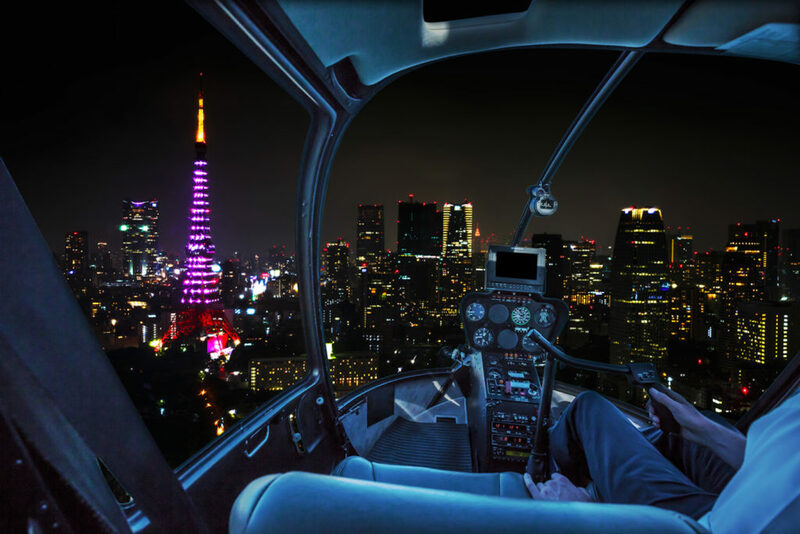 Based in Shin-Kiba, helicopter company Nihon Flight Safety run helicopter tours that will take you over Tokyo Bay, circle Akihabara and pass by Shinjuku and Roppongi so you can admire the city in its all its sci-fi-esque glory. If you can, the best time to catch a flight is during the evening when the city transforms from endless grey blocks under the hard light of day to sprawling, sparkling towers of light punctuating the cloak of darkness. The regular flight runs for about 15-20 minutes, but in that time you’ll cover the entire city. Prices vary between ¥39,000 to ¥45,000 for two people depending on what time and day of the week you plan to fly. Daily departures 1 p.m. - 8 p.m. 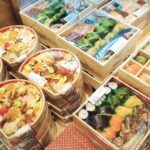 Although a buffet isn’t necessarily the first thing that comes to mind when thinking about Japanese cuisine, like every other aspect of the culinary world, Japan’s chefs have mastered the art of the buffet and elevated it to a whole new level. A far more elegant affair than your standard all-you-can-eat offerings, the Sky Grill Buffet Musashi in the Asakusa View Hotel is all about fine Japanese, Chinese and European dining (with over 150 dishes) that’s second only to the 26-floor-high view. 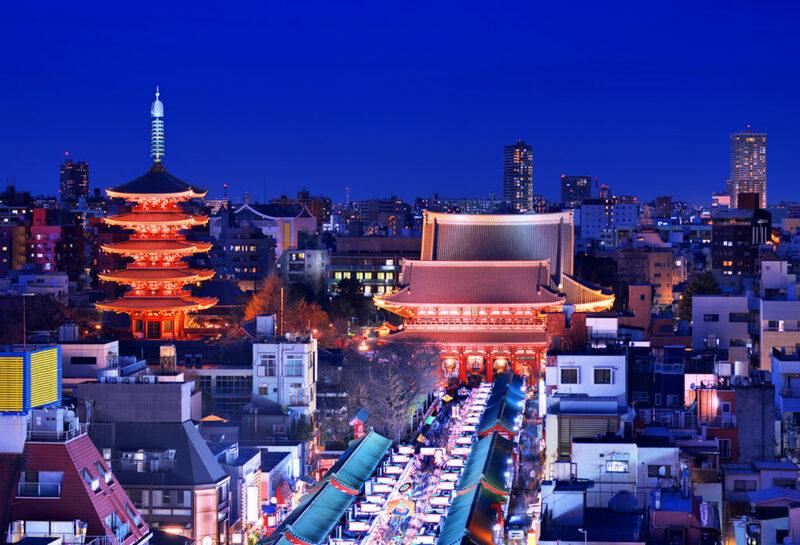 The hotel is situated in the heart of old Japan’s Asakusa district, home of Sensoji Temple, and looks out onto the futuristic Tokyo Skytree, making for a scene that’s the epitome of contemporary Japan — modernity sprouting from a historic landscape. The buffet costs ¥3,780 for lunch on weekdays and ¥4,280 on weekends. Dinner is ¥4,980 on weekdays and ¥5,480 on weekends. If you are a little bit of a foodie, it’s worth noting that the restaurant’s grilled dishes are cooked in an oven made of lava stone from Mt. Fuji. 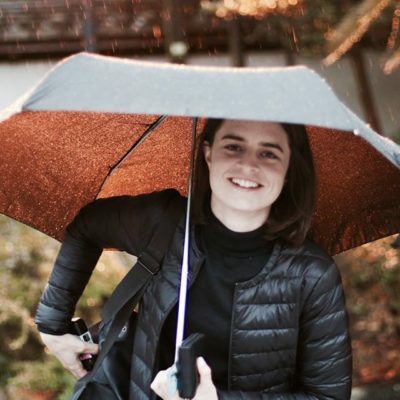 It appears like all the ways we’ve been exploring Tokyo so far are from up high, but to really feel the rhythm of the city, you’ve got to get down and dirty, feet on the pavement, zigzagging through the city’s endless laneway networks. 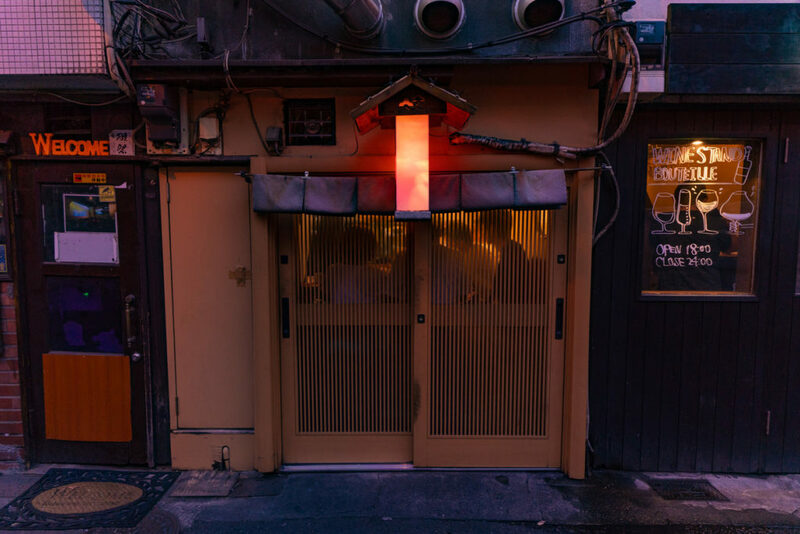 There’s no better way to lose yourself in the looser side of Tokyo than by visiting Golden Gai, the labyrinthian network of ramshackle bars stacked atop one another in a lantern-lit corner of Shinjuku. Each as unique as the people that run them, it’s hard to classify what a Golden Gai bar is. Some look like nothing more than glorified cupboards while others are booze-soaked shrines dedicated to a huge cross section of sub-cultural obsession. These days Golden Gai is a not very well-kept secret, so it can get a little rowdy, especially with the number of foreign guests taking advantage of Japan’s relaxed street drinking laws. That said, the offerings are endless, so if you’re willing to look hard enough you’ll find that one little special place to call your own.